You should read this book before you buy another sharpening gadget. It will teach you all about knife sharpening - how to select a sharpening system and how to sharpen a knife to a razor edge. There is also information about abrasives, knife steels, sharpening theory, honing & stropping, electric sharpening machines, using steels; and how to sharpen other cutlery - vegetable peelers, axes, chisels, plane irons and other common tools. Illustrated with over 80 new photographs and drawings. 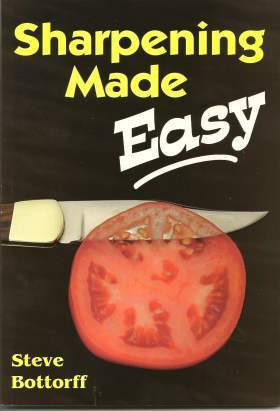 Sharpening Made Easy is the best knife sharpening book on the market. In knife store displays where customers can compare them side-by-side, Sharpening Made Easy outsells the mass media knife sharpening book by 2 to 1. Buy With Confidence. Our checkout is secured with SSL. No one ever sees your credit card information. Sorry, we cannot accept credit cards by phone or mail. Order by mail. Click here for a order form to pay by check or money order.